Phones have on-screen keyboards. Laptops have clamshell designs. The next-generation enterprise mobile device will have both. A dual-screen clamshell mobile device makes sense. Smartphone makers want to maximize screen real estate. This form factor doubles it to the size of a small tablet. Tablet makers want portability. The dual-screen clamshell mobile enables a tablet to be folded in half and put into a pocket. Phone mode. With the clamshell closed, hold it to your ear and talk on the phone. Laptop mode. Open the clamshell part way. The bottom is an on-screen keyboard, and the top is a screen for apps and icons. Book mode. The clamshell is opened as in laptop mode, partway, but by holding the screens vertically, it becomes a book with the two screens akin to the two pages of a book. Two-screen, single-user mode. The clamshell is opened either partway or all the way flat, and each screen runs a different app. The top screen, for example, could be show video call or presentation and the bottom screen could hold a document for taking notes. Tablet mode. With the clamshell opened up flat, both screens become one screen that’s double the size and used like any tablet. Single-user tent mode. The clamshell opens beyond flat, hyperextending the hinge and allowing the screens to face outward at an angle. This enables the device to be self-propped up on a table. When only one screen is on, it becomes like an ordinary smartphone that’s placed at a convenient angle by some third-party accessory (but without the accessory). It could be used with an external keyboard, or just for viewing. This mode is ideal as a bedside alarm clock. Dual-user tent mode. The device is opened as in single-user tent mode, but both screens are on and showing two versions of the same thing. This mode enables a business presentation at a table, where the presenter and the presentee see the same slides, screens or videos on each side of the device. Smartphone mode. With the clamshell opened all the way so that the outside surfaces of the phone are touching on the inside and the screens are on the outside, with one screen on and the other one off, the phone can be used the way we all use our regular smartphones today. The dual-screen clamshell idea isn’t new. The One Laptop Per Child initiative — a nonprofit founded to put low-cost, rugged and easy-to-use laptops into the hands of children in developing nations — developed a brilliant concept called the X02 about 10 years ago. The device was a dual-screen clamshell device the size of a small laptop, and I talked about it in this space years ago. The organization even built a prototype. But the idea was too early and couldn’t be supported by the technology of the time, and the X02 program was canceled. A few years ago, a smattering of dual-screen Android smartphones came and went. The Kyocera Echo (also known as the Sprint Echo) was sold in the U.S. by Sprint in the spring of 2011. The device was tiny, with two 3.5-inch screens that, in tablet mode, formed a single 4.7-inch screen. A smartphone called the Imerj emerged in the same year. A prototype was designed and built in a partnership between Imerg and Frog, resulting in an Android phone with two screens and a custom user interface. It was pretty small by today’s standards; the two screens together formed a 6-inch screen. One of the most innovative dual-screen devices was the Sony Tablet P, which came out five years ago. The screens were as close together as the technology of the time would allow, but around the outside edges of the screen was a whopping one-inch bezel. The Tablet P was considered too large and expensive for a smartphone at the time, but by today’s standards it’s normal sized and cheap. What all four of these devices have in common is that they were attempted before technology was ready. * Better haptics. People need tactile feedback on a keyboard. A great on-screen keyboard will need advanced haptics to simulate the clicky feel of physical keyboards. * Thinner phones. The extreme thinness of today’s best smartphones demonstrates a capability to produce a device that’s not too thick, even with two halves. * Shrinking bezels. This is key. Technology is quickly advancing toward the no-bezel singularity, which would enable dual-screen clamshell devices to have continuous-screen real estate across both halves. * True, high-performance multitasking. Because both screens will often be doing different things, fast and true multitasking will make or break the performance. * Biometrics that don’t require a front or back fingerprint reader. Using face ID as in the iPhone X or in-screen fingerprint reading technology as in the Synaptics Vivo will enable dual-screen, clamshell mobiles to authenticate without needing bezel space for a fingerprint reader. As the technology gets better, the major companies are getting closer to releasing dual-screen clamshell devices. All the biggest smartphone companies have been thinking about this for years. Microsoft was recently granted a patent for an innovative hinge for a clamshell device. 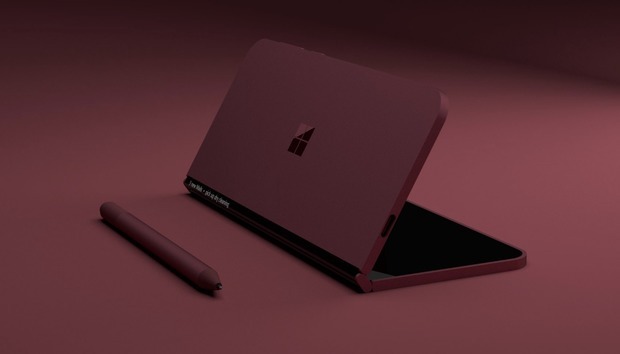 Some speculate the hinge is for the rumored dual-screen Surface Phone. Designer David Breyer posted on Twitter compelling illustrations of what a Microsoft Surface Phone could look like, based on the hinge patent (see photo at top of this article). The hinge is notable because it enables zero gap between the screens. When snapped out flat, the two screens become one screen. If you recall, Microsoft made waves in tech circles back in 2009 with a pen-based dual-screen concept called the Courier. The Courier wasn’t an all-purpose device concept. Instead, Microsoft envisioned a kind of special-purpose organizer, according to the concept video. Google was granted a patent last month for a radical two-screen tablet. The Google invention comes with a crazy twist: The top and bottom halves can separate and operate independently as two separate tablets. But when connected, the Google gadget could become a single tablet with twice the screen real estate, or a laptop with the bottom screen functioning as an on-screen keyboard and touchpad. When connected, the two halves share power and can both be charged with a single charger connection. Samsung is rumored to be prepping a CES unveiling next month of a dual-screen folding smartphone. The company has reportedly been working on clamshell phones for years (as this 2014 concept video reveals) — and could release one or more in the first half of 2018. One strong possibility, however, is that it won’t be a clamshell device per se, but instead the reinvention of the flip phone. The “hinge” could include a flexible, uninterrupted display on the short edge, not the long one, resulting in a long, skinny phone when opened, as with one Samsung patent. Or it could be a clamshell device, as with another Samsung patent. Or Samsung could announce both. Or neither. The most commercialized realization of this vision comes from China. ZTE announced in October a product called the Axon M, which is a dual-screen phone. Specifically, the Axon M sports two 5.2-inch screens, which can be used in laptop, tablet or “tent” modes. One innovation enabled by the dual-screen clamshell concept, which I hadn’t thought of until ZTE described this phone, is that it needs only one camera for regular picture taking, selfies and video calls. The phone has a single, mind-blowing, 20-megapixel camera. The Axon M may be a bit premature. When closed, the phone is too thick. One half of the phone is way thicker than the other. (Ideally the two halves would be identical.) Also, the phone closes with the screens outside, rather than inside. Instead of protecting the screens from scratches and smudges by closing the clamshell, both screens are exposed when closed. The screens aren’t without bezels, so the two screens don’t fully touch in the middle. Where the screens should meet, there’s a bezel, plus an “edge” to the device, then a small gap. It all adds up to an unacceptable distance between the edges of the two screens in tablet mode. Still, ZTE deserves credit for beating others to market with the dual-screen clamshell concept. And finally, we get to Apple, which has its own patents around dual-screen clamshell devices, including this one granted last month. As with some of Samsung’s patents, the Apple patent describes a flexible display. Tablets will always be with us. But if and when dual-screen clamshell mobiles go mainstream, midrange tablets will go the way of the connected organizer and pocket PDA. I think there will be a market for very high-end tablets like the iPad Pro, or very low-end tablets like the Amazon Fire line. The midrange of the market will be gutted by dual-screen, clamshell smartphones, because they’ll also serve as tablets when users need one. The coming year will usher in the first serious dual-screen clamshell phones — and begin to usher tablets right out the door.